Last week we shared why the Box Tops for Education™ program is so important in our home, and for the schools in our community. 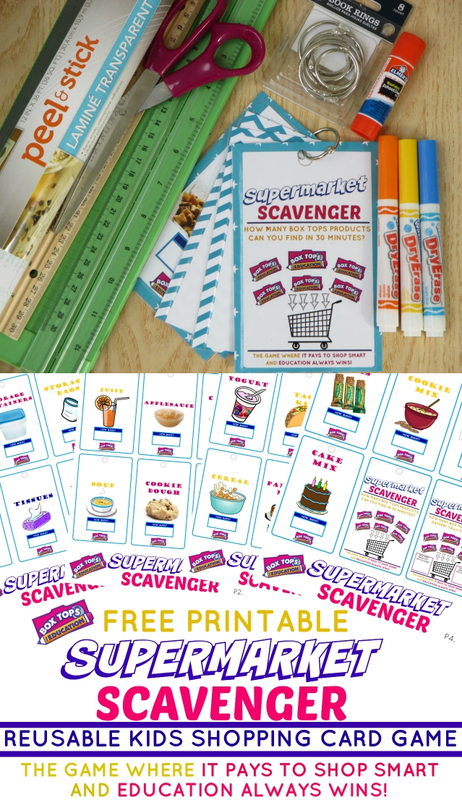 This week I'd like to share a fun printable Supermarket Scavenger reusable kids shopping card game that I created for my kids. 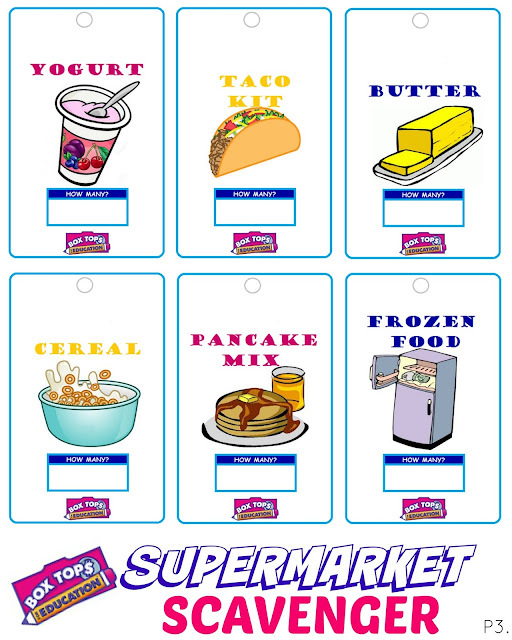 This game encourages children of all ages to get excited about collecting Box Tops For Education™ for their school! The game has large picture images and written text. Early readers can easily identify the pictures, while older children can read the text. Check out the full printable card game below, along with instructions on how to play, and a quick tutorial on how to assemble the card game. Also, see how you can easily make the surface of your cards compatible with dry-erase markers. So that the kids can play again and again, each time that you head to the supermarket! Clear / transparent contact paper, self stick laminating sheets, or laminating machine with laminating sheets (we used transparent contact paper on the completed cards pictured). 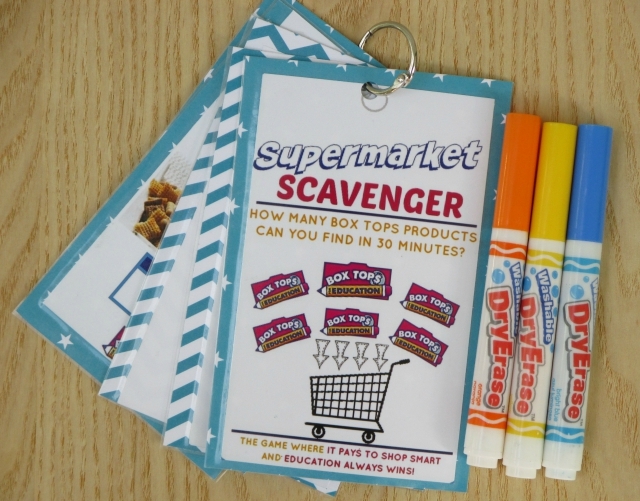 A dry erase marker to record / tally your box top points as you find them / when your finished shopping and are tallying your Box Tops (easily wipes clean from the clear contact paper / laminate with a paper towel when the game is complete). Print all four pages of cards below using our free printable images. To print, right click on the image. Select to save/print. Note: each of the printables / image files below are sized to fit 8 x 10 paper/card stock. Cut each of the cards out (using the blue outline on each card as a guide). Optional step: Mount each your cards on card stock using craft glue stick. Allow adequate time for drying. Cut your cards out leaving a 1/4" outline, so the scrapbook paper shows. Laminate your cards front/back either using a laminator and laminate sheets, self stick laminator sheets, or clear/transparent contact paper. 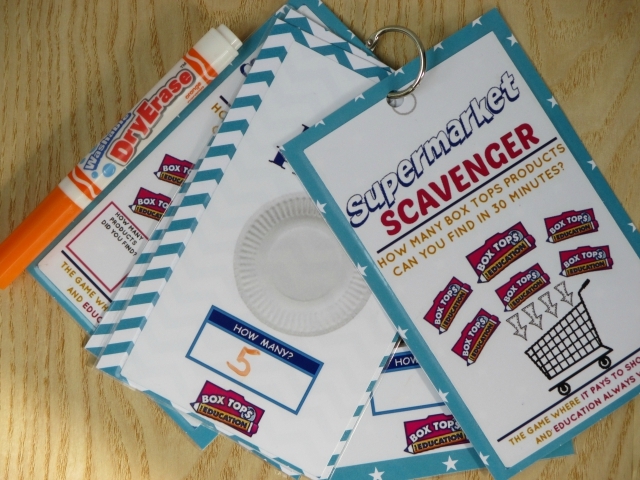 Use the circle at the top of each card as a guide, and use a hole punch to create a hole on each of your cards for handy storage on a binder ring or book ring, for easy toting while at the supermarket. 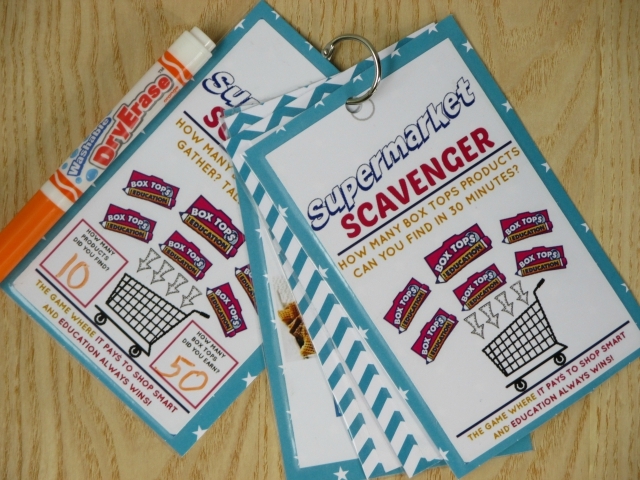 ​Now that you've successfully assembled your Supermarket Scavenger card game, it's time to head to the store to play! shopping trip, on your tally card. 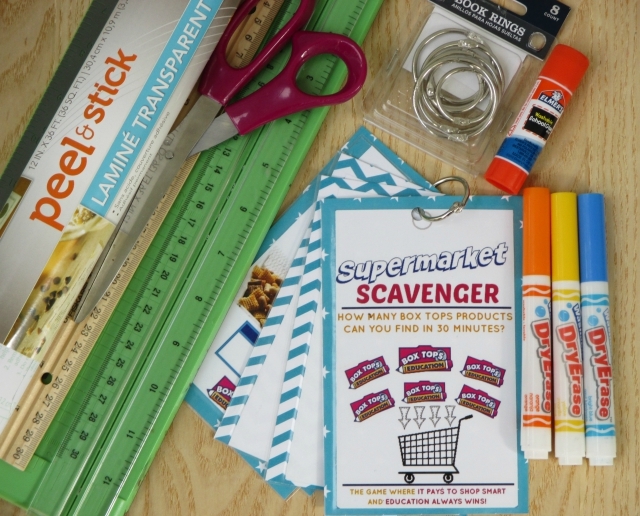 The person with the most products found / Box Top points earned, WINS! But be sure to remember that no matter who wins the game, it is YOUR school that ultimately WINS! Did you know? 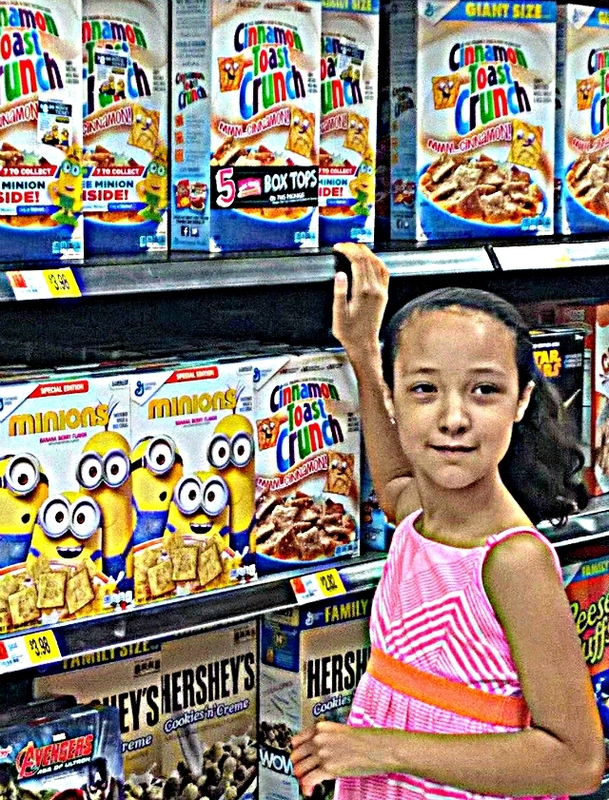 Box Tops are worth $0.10 for your child's school, and that Box Tops For Education is one of America's largest school earnings loyalty programs? Over 80,000 k-8 schools participate in the program! 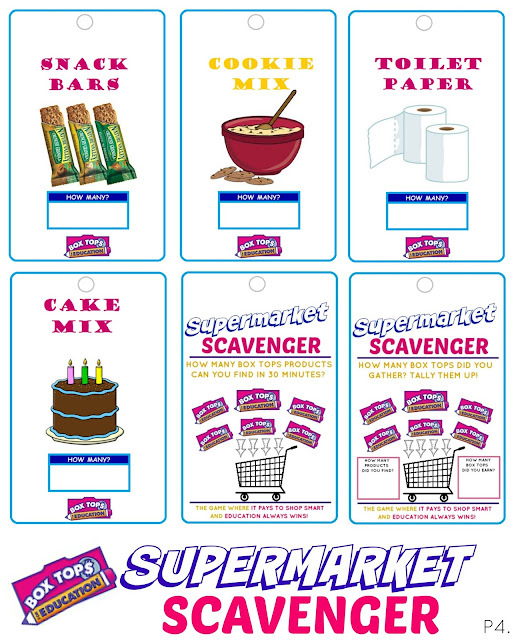 Participating schools can use Box Tops cash to buy whatever they need. All-in, Box Tops for Education has contributed over $525 million to participating schools, since the launch of the program in 1996. 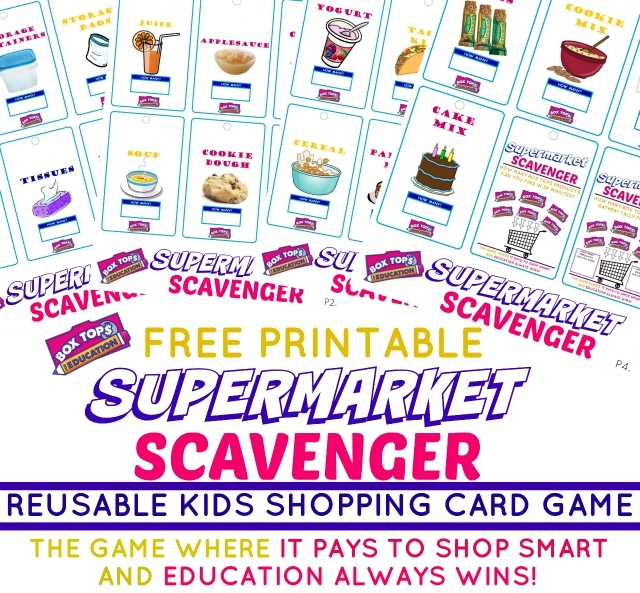 Print your FREE Supermarket Scavenger Shopping Game Cards below, and start playing to WIN for YOUR school today!